JERSEY CITY – Mayor Steven M. Fulop, the Jersey City Police Department, the Police Officers’ Benevolent Association (P.O.B.A. ), the Jersey City Police Superior Officers’ Association (P.S.O.A. 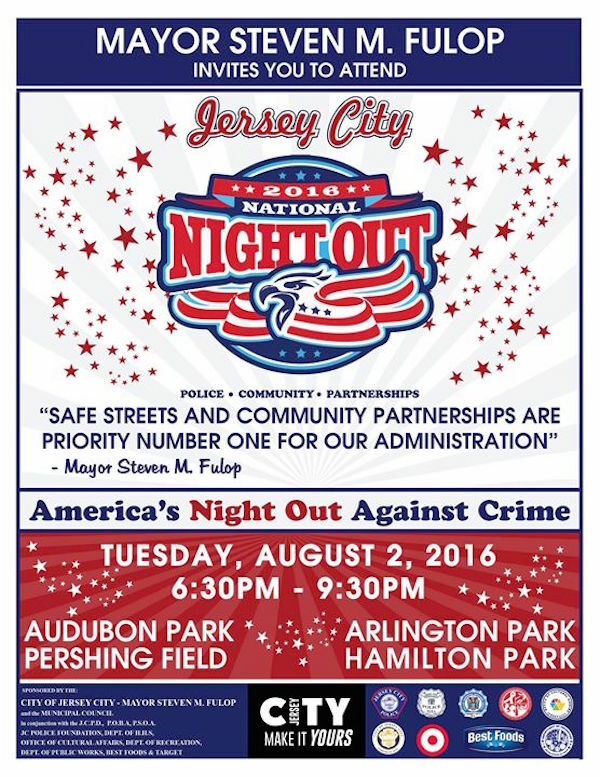 ), and the Jersey City Police Foundation, will be hosting the annual National Night Out Against Crime event for residents and police officers at four locations citywide on Tuesday, August 2, 2016, as the Fulop Administration continues to expand its emphasis on public safety and community policing. The annual event, now in its 32nd year, will feature activities for both children and adults alike and is an opportunity for residents to get more familiar with veteran officers and new recruits that protect them on a daily basis. This has been an ongoing effort by the Police Department to continue to strengthen community relations. Residents are invited to attend one of the four city parks hosting National Night Out events from 6:30 p.m. to 9:30 p.m. at Audubon Park, Pershing Field, Arlington Park and Hamilton Park. At each park, there will be moon bounces, balloon sculpturing, a dunk tank, popcorn, hot dogs, giveaways and more. Various community and service organizations will be on hand to provide information to the public, and neighborhood group leaders will be recognized for their contributions to the community. The Police Department’s Community Relations officers are assigned to improving the effectiveness of the Jersey City Police Department by facilitating a cooperative effort between the police and the community through various citywide programs and services. National Night Out is one of the Department’s most notable events. It puts emphasis on crime prevention awareness and generates support for anti-crime programs. Since taking office in July of 2013, Mayor Fulop has hired more than 170 new police officers, including three classes that graduated the academy this summer. An additional class of 40 officers are scheduled to enter the police academy in the fall. The Fulop Administration has also redeployed dozens of police officers from special units and administrative posts to patrol, increasing the number of officers interfacing directly with the community. All of the new officers who joined the force this summer and last year have been assigned in teams with veteran officers to walking posts in the south and the west districts. Several of the new officers will be on hand at Arlington and Audubon Parks to meet with community members. Mayor Fulop has expanded the Police Diversity Recruitment initiative since taking office, holding a diversity recruitment session and deploying a Marine Corps model that operates in the community to work with interested applicants throughout the recruitment process, encouraging them and providing necessary resources such as academic and physical training. The new recruitment office, which now has two full-time officers assigned, is strategically located at the HUB on Martin Luther King, Jr. Drive. National Night Out, “America’s Night Out Against Crime,” began in 1984 as an effort to promote involvement in crime prevention activities, police-community partnerships, neighborhood camaraderie and send a message to criminals letting them know that neighborhoods are organized and fighting back. National Night Out is held annually on the first Tuesday of August, and now involves more than 37.8 million people and 16,124 communities from all fifty states, U.S. Territories, Canadian cities, and military bases worldwide. At 9 p.m., Jersey City residents are encouraged to participate in National Night Out by turning on their home or porch lights. Churches are asked to ring their bells as a gesture of unity to support and promote safety in their neighborhoods and communities. Additional sponsors for the event include: the Department of Health and Human Services, the Office of Cultural Affairs, the Department of Recreation, the Department of Public Works, BJ’s Wholesale, Sysco, Aramark, Best Foods, and Target.